We expect Chevrolet to resurrect the Blazer name for a midsize crossover utility vehicle (CUV), with the next-generation Chevrolet Blazer slated to reach the market around the 2019 model year. Following is speculative and unconfirmed information about the next Chevy Blazer. This page is a continuous work-in-progress and will be updated on a regular basis as we await official details from General Motors and Chevrolet. Where: sold in all current markets where Chevrolet has a business presence, including the United States, Canada, Mexico, Central and South America, China, South Korea, and the Middle East. The next Blazer could be sold in more countries if the Chevrolet brand enters new markets. Our expectations of the new Chevy Blazer are based on GM’s trademark filings and spy shots. In November 2015, General Motors filed two trademark applications to register Blazer and Chevrolet Blazer with the United States Patent and Trademark Office (USPTO). The filings point to GM’s interest in securing the name for use in a future product/vehicle. In December 2016, a new Chevrolet crossover was photographed undergoing testing. The vehicle has similar proportions to the 2017 GMC Acadia to which it will be mechanically related. We expect the upcoming future Chevy Blazer to be offered as a midsize crossover utility vehicle (CUV). 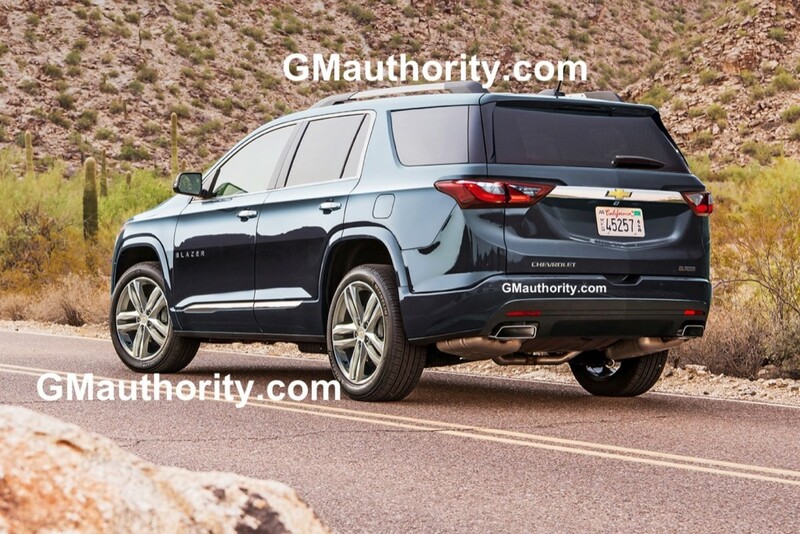 We expect that the starting price of the next Chevy Blazer will be roughly $27,000, enabling the full-size, second-generation 2018 Chevrolet Traverse to slightly move upmarket and become several thousand dollars more expensive. We expect the next Chevy Blazer to ride on the GM C1 platform shared with the 2017 GMC Acadia and 2017 Cadillac XT5. The long-wheelbase version of this platform will underpin the 2018 Chevrolet Traverse and 2018 Buick Enclave. We expect that the next Blazer will be offered with either six-speed automatic transmission or the new GM 9T65 nine-speed automatic transmission. We expect the Chevy Blazer to be assembled at a GM US factory, potentially the Spring Hill plant in Spring Hill, Tennessee, USA. Discuss the next Chevy Blazer in our Chevrolet forum. Follow our coverage of Chevy Blazer news.